Dana – Before I went grocery shopping today I perused your blog for meal ideas. I am horrible at planning ahead for meals and you have so many ideas that seem straight forward, varied and delicious. I love the way you present them, too. Thanks! This looks fantastic and I just bought big eggplants this morning! I, on the other hand, LOVE eggplant! I feel like it’s just so versatile and it seems to quell my husband’s desire for a “meaty” dish. I can’t wait to try this out on pasta- yum! I love this Sicilian relish, and it must have CELERY and RAISINS in the mix. 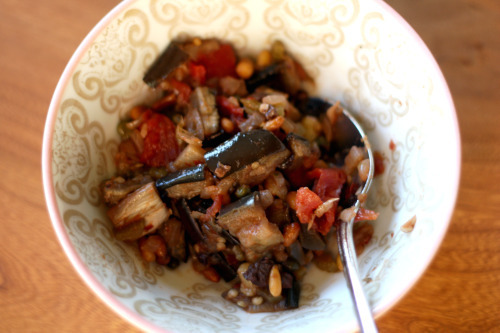 i love caponata,yours is delicious! glad you’re coming over to the bright side of eggplant! it really is delicious. another dish to coax those who are hesitant is baingan bartha — an indian mashed eggplant with spice, peas and yogurt. i’ve not tried her version, but in a quick search molly’s recipe seems closest to the kind i’m used to and love: http://orangette.blogspot.com/2008/02/over-and-over-again.html. enjoy! Fantastic dish. Great recipe for summer eggplants! Normally, I am not a fan of eggplant, but yours looks delicious. I hate the mushiness of eggplant (at least that’s the way my mom always made it)…but yours seems so ‘clean’ and non-mushy. The whole dish looks lovely. I have to say, I am an eggplant lover. But I understand your plight. I was a picky eater as a kid as well and I think in many ways, I’ve forced myself to like foods that I’ve hated as a kid. I just kept forcing myself to eat them until I made myself like that. I love caponata but haven’t quite found the PERFECT recipe yet. Could this be it? We shall see… it certainly looks good! I’m still wary of eggplant though I have had it a couple of times recently and it was very well done. 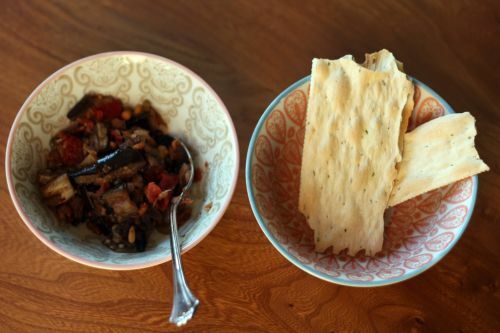 This caponata looks so good that I will have to give eggplant another chance! Ooh I forgot to mention that I made this the other day & was delicious! We ate over pasta, but will enjoy the leftovers on crostini. Thanks!